UNITED NATIONS.— Cuba yesterday [Oct. 7th] warned of the serious dangers threatening the existence of the human species at the United Nations General Assembly, and called for commitments to address them. “Humanity is literally facing life and death,” the Cuban Ambassador to the UN, Rodolfo Reyes, said during a plenary of the Assembly devoted to discussing the report of the Secretary-General Ban Ki-moon on the work of the organization, according to PL. The Caribbean diplomat noted that nearly 70 years following the creation of the United Nations, the planet and its 7.2 billion people are at the mercy of nuclear weapons, climate change, severe and rapiding spreading epidemics and the attacks on sovereignty and self-determination of peoples. Nothing can justify that 25 years after the declaration of the end of the Cold War we continue to be threatened by more than 16,000 nuclear weapons, a quarter of which are ready for immediate use, he stated, according to PL. Reyes ratified the position of the island that the only way to rid humanity of this danger is the total prohibition and elimination of these lethal devices, whose devastating impacts were felt by the residents of Hiroshima and Nagasaki, the Japanese cities which the United States dropped atomic bombs on in 1945. He noted that many member states have proposed to agree on a comprehensive convention on nuclear weapons, to prohibit their possession, development, production, testing, storage and transfer, as well as their use or the threat of using them. We urge the Secretary General to contribute with his influence to the beginning of negotiations for such an agreement, he said. 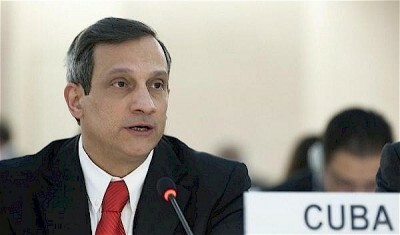 The representative of Cuba to the United Nations addressed the unfavourable scenario created by climate change, resulting in the decline of the ice caps, rising temperatures, the gradual rise in sea levels and ocean acidification.